KSB's Eta pumps keep the world on the move with unrivalled product and service diversity as standard. All pumps from the Eta family offer optimised hydraulic systems in an (almost) infinite number of variants. Operating reliability is of utmost importance in the chemical industry. 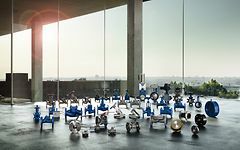 To ensure aggressive fluids are transported safely, KSB meets the toughest quality requirements and draws on its unique materials expertise for manufacturing pumps and valves for such services. A full range of high and low pressure gate, globe and check valves for the USA market.